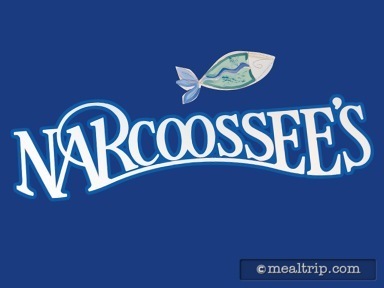 For many, Narcoossee’s is probably most recognizable as that “octagon shaped building” that you see across the Seven Seas Lagoon by the Grand Floridian as you pass by on the Ferry Boats from the parking lot to the front gates of the Magic Kingdom. It is in fact, another one of the Grand Floridian’s Signature restaurants, and probably the more casual of the resorts’ three signature locations. You will have to pass through the resort and venture into the great outdoors in order to get down to the waterside location (which can be a bit of a hike, if you’re parking in valet, or scooting in via Monorail). Once there, the American Coast Cuisine inspired menu is mostly sea-based food but also includes the expected alternatives... steak, chicken, and pork. The menu is said to change a bit seasonally. As with most of Disney’s signature locations, there is a more extensive wine list than found at other “normal” restaurants, and includes some imported beers and other cocktails as well. The location does offer a unique view of the Wishes Fireworks and the Electric Water Pageant. Unique in this case does not mean perfectly squared off and unobstructed... it just means that if you’ve seen those shows from other locations, being seated (basically) at water-level offers a different perspective. It should probably not be “the” reason you dine at Narcoossee’s though.